The existing ‘Atos’ process* for Employment and Support Allowance (ESA), some components of Universal Credit (UC) and Personal Independence Payments (PIP) is recognised to be brutal and inhumane. The Department of Work and Pensions’ desire to replace it is fundamentally to be welcomed. Where DWP ends up with regard to health information will likely be something modelled on the British Medical Association’s agreement with the Association of British Insurers on GP reports. This agreement provides a published definition of what data is medically relevant, with clear standards and a template form in which a report must be produced, including the structures and uses to which the data can and cannot be put, and a commitment on the part of the data recipient (in this case, the insurance company) to respect the medical view. It is this last element with which DWP is most likely to struggle – but without it, all the rest is undermined. Were data sharing with DWP to be perceived in this way, the provision of care and medical research – and public confidence and trust in both – would be undermined to a far greater extent than care.data ever did. Such data sharing would arguably be more dangerous and harmful overall than the Atos assessment process, as GPs would have consider competing incentives around the information provided by their patients – not knowing in advance which Departments would get to see it, nor when DWP might send letters demanding they change their medical judgment. DWP cannot address these issues alone and in secret – a tender is never a good place to start, and the current one could potentially catastrophically undermine any improvements. Were a third party being contracted to make automated decisions, DWP could (and should) expose the ‘business logic’ upon which those decisions are to be made. But that is not what DWP is doing. Some of the decisions being made are really, really simple – being pregnant, for example, is a binary state indicated by a medical test, from which processes can result. And a ‘terminal’ state is a medical decision, made for medical reasons. While the actions of DWP and its contractors may suggest that some terminally-ill patients are ‘fit for work’, we do not imagine this to be an explicit policy intent – more a result of the systematic process neglect that the current Secretary of State has expressed a desire to resolve. Will DWP accept a ‘terminal’ definition from the NHS in future? If not, as now, nothing that DWP does will matter. Most areas of controversy are not fully automated, nor even fully automatable. While a recorded status of ‘terminal’ may (trivially) be the result of a human pressing a button, when the doctor presses that button has to be based on a carefully considered discussion with the patient – which should only be about how they wish to die, without any implications or insinuations from target-obsessed bureaucracies of the state. The Atos processes exist because DWP does not trust the data it could get from the NHS. As has become evident, there are processes where NHS doctors offer ‘fit notes’ the DWP requires them to provide, but pressures them not to. This is DWP gaming the very system that it set up in an attempt to make it not be gameable by anyone else. And this remains the context in which the tender has been issued. Patients must believe that the information they give to their doctor will not be used against them. No data protection law, old or new, allows the DWP to rifle through GP records without an explicit legal case. However the Atos process is replaced, whatever replaces it is going to require new legislation – informed by all of the stakeholders, in a public debate. Any data access or data sharing cannot be done under Data Protection law alone. It is not part of the NHS’ or GP’s public task to assess benefits for DWP, and DWP cannot ‘ask’ for consent when that ‘consent’ is a condition of the social safety net that makes it possible for a person to buy food. (DWP may try; it will fail.) So any replacement is going to require primary legislation – and that legislation cannot be initiated by DWP alone, and certainly not by issuing a tender. DWP has no way of knowing that some of these barriers even exist. For example, the new ‘NHS Login’ service will be necessary for any digital service that interacts with the NHS. And, in an explicit decision decision by NHS Digital (we argued against it; they ignored us, in writing), the NHS Login service passes the patient’s NHS number to every digital service. While this may be good for direct care, it is terrible for anything else. As a result, any DWP ‘data broker’ or ‘trusted third party’ using the NHS Login will have a copy of the patients’ NHS number that the NHS would argue they are prohibited by law from having. On an even more fundamental matter, the DWP is going to have to work with the NHS and medical professional bodies if only for the reason that it has little – if any – experience with coded health data on which the health service runs. Interpreting a person’s condition into (or from) dated medical events is a highly-valued clinical skill and, on the evidence of the outsourced work capability assessors, not one that will prove easy to duplicate. We also have a further, modest, proposal. * By ‘ATOS process’, we mean the Work Capability Assessment for ESA or UC – run by Centre for Health and Disability Assessments Ltd, a subsidiary firm of Maximus – and the assessments for PIP – run by Capita and an arm of Atos, trading as ‘Independent Assessment Services’. This entry was posted in News on April 1, 2019 by Phil. TL;DR – just because they ask (nicely) doesn’t mean it’s GDPR consent. Clinical consent is informed consent for a clinical course of action, such as “Yes, you can amputate my arm”. If doctors don’t get clinical consent from a conscious patient, it’s GBH. Sharing the medical records required for direct care is implicit from the clinically-consented decision, but that isn’t a GDPR consent – though it is part of the public task of the NHS body providing that surgery. GDPR provides six different legal bases for data use. Consent is the one most often used in the private sector – you technically consent to Facebook’s abuse as part of Facebook’s terms of service. (Given what many experience as social obligation to be on Facebook, whether or not the consent there is meaningful and freely given is an interesting question for others, but outside the scope of this consideration. The Information Commissioner’s guidance is clear – except in a few highly specific circumstances – public bodies shouldn’t use consent as their legal basis for their public task. Indeed, doing so is probably invalid. A public body can always ask if you wish to go through a data sharing process that will make your life easier – that’s politeness, not GDPR – but that is not the same as asking you to consent to it processing your data in order to receive a service or benefit. In the most benign of cases, the two may be virtually indistinguishable – but while the first is a meaningful choice that has no effect on the outcome, the other is a requirement of accessing the service and so consent cannot be freely given. “Give us your data or you don’t get your benefit” isn’t consent. It’s coercion. Under GDPR, both the process itself and the legal basis for how your data will be used must be clear – even if the organisation processing your data doesn’t ask you whether you want it to or not. Most public bodies will have a lawful basis for processing your data under what is called their ‘public task’ (the private sector version of public task is ‘legitimate interest’). Critically, the process cannot offer you a different outcome if you hand over or allow it to access more personal data – though it is allowed for this to make that same process faster. The same word being used in two different contexts doesn’t help, but another cause is the fundamental lack of clarity on how data is used, and the inaccuracy that comes from the process. Every bit of data processed by digital government ultimately comes down to someone typing something in via a keyboard and, as anyone who reads Twitter will know, such input may not always make complete sense. Officials are trained to believe that the data is perfect and ignore reality – and it’s the citizen who pays the price, and the most digitally excluded pay first and pay the most. Every use of personal data by a public body must have a lawful basis, which can be known by the data subject. Those uses can be listed, and should be listed (including, around data sharing, in registers of data sharing agreements). A UK resident should be able to know how their data will be used in advance of dealing with that public service – in practice, in the public services, existing law, process, and safeguards mean that it is not often necessary to do so, as one person’s data should be treated the same as another. No citizen is expected to sign ‘terms and conditions’ or an ‘acceptable use policy’ when dealing with Government – nor should they be. The private sector uses such mechanisms because their acts are not based in public policy and law (as Facebook has recently shown). A public body may, as a matter of policy and in politeness to the people it serves, ask whether a citizen is willing for data to be shared with another body; this is not ‘consent’ in the Data Protection terminology – though, if asked and declined, the data sharing must not occur anyway (in which case the ‘consent’ choice would be unfair). Asking the citizen is an offer, and can also be a mandate for the policy, but it is not a basis for legal consent. This entry was posted in News on March 31, 2019 by medcon. The Summary Care Record is a (mostly) consented system run by NHS Digital that works (after a decade), and will be replaced with NHS England’s LCHR programme, which is neither consented nor working (and will take at least a decade). The fundamental point of the Summary Care Record (SCR) is that it is accessible nationwide. If you live in Cornwall and visit A&E in Carlisle, a doctor there can see the medications you are prescribed – unless you have chosen that they shouldn’t. When the ‘NHS app’ launches, you will (should!) be able to see where your SCR has been accessed – although, as with other NHS.UK services in the queue, you need to be able to log in to NHS.UK before that can work. NHS Digital is still consulting on tweaks to the SCR for carers – a use case that the LCHR programme is far from being in a position to consider. The LCHR programme, which we’ve covered before, often chooses mass data copying – so if you live in Newcastle and fall off a horse in Newmarket, it is unclear what happens, and whether or how those accesses or copies are consented. The LCHR programme breaks at every boundary you cross, because it is designed and run by NHS England for NHS institutions not patients. There is, as yet, no Information Governance model, there is no patient (or care provider?) accessible audit trail, and the change in name from ‘Local’ to Longitudinal Health and Care Records (page 99) also implies that the data held within them will be eternally expanded, rather than kept to the initial tightly defined dataset – care.data2? The plan also refers to “The use of de-personalised data extracted from local records” (page 97), which suggests that LCHRs are intended to be used for both direct care and secondary uses – perpetuating the festering wound which is NHS Digital’s continuing disregard of the GDPR around the extraction and dissemination of data that GDPR considers identifiable. The use of “de-personalised” in this context (para 5.27) is a grasp at the figleaf of obfuscation that continues to be defended by the Wellcome Trust. Lacking an appropriate IG model, there is no consent for the secondary uses of the records that LCHRs are sucking up – meaning the devolved LCHR teams are not only lying to patients but also, in contrast to the publicly owned SCR infrastructure, they have generally outsourced the data handling to the private sector. While replacing SCR is not necessarily a problem, replacing one data copy with a different, inferior data copy is not progress to anyone other than the IT companies that will get new contracts for what was previously a publicly-run service. NHS England delegating blame but not control is not a new phenomenon, nor is issuing plans that undermine and will remove what another part of the NHS is proposing to add to help patients. The hint in paragraph 1.38 of online NHS services to help the mental health crisis is welcome, but the detail – barely two sentences of vague hand waving in chapter 5 – do not meet what is claimed, let alone what is needed. The standards the Secretary of State sets for the NHS are not merely that its services are ‘safe’. He can have views on the user experience of an app, but user experience is not safety. There is a fundamental difference, and patients assume the NHS will never be unsafe – which is why there is such concern when it turns out not to be safe. The Secretary of State can say what he thinks ‘good’ looks like, but ‘safe’ must remain within the remit of qualified professionals. Criteria for ‘safe’ are absolutely necessary, if not sufficient – it is entirely appropriate for there to be separate criteria for what is ‘good’. ‘Good’ apps may be what the public choose, but ‘safe’ is what they expect – apps can be both. As an app example, Matt has chosen that the money for his GP registration should go to Babylon in London rather than the surgery in his constituency. He feels this works well for him, as someone who likely rarely needs a doctor, and disregards any wider harm that comes from taking funds away from the doctors in his constituency. The choice of what is ‘good’ is partially subjective, and different patients will make different decisions. The critique from the profession that the app is unsafe, however, is met with a response that someone thinks it is good. These are entirely different criteria, and both groups are talking past each other – the criteria of ‘safe’ and ‘good’ should be separated; as noted above, the former is necessary but not necessarily sufficient. The Secretary of State can add standards for what ‘good enough’ looks like, without reducing safety, if he so chooses. At the insistence of DH, NHS Digital has pulled its consultation on the ‘Clinical Data Architecture’ Principles “so that we can ensure consistency with wider emerging strategies”. The Secretary of State continues to laud the first draft of his Vision, while the “Code of Conduct” update is delayed to let the AI companies lobby more, but how visionary is it? The Vision the Secretary of State proclaims doesn’t seem any more visionary (or meaningful) than a late night monologue from an NHS manager in a hospital corridor about how GPs should work. The Plan suggests there will be new legislation, in which we will look for the National Data Opt-out to be placed on a statutory basis – rather than remaining a gift of a Secretary of State. We note that the National Data Guardian Act 2018 has now received Royal Assent, which is welcome progress. Its recent Board papers state that NHS Digital is also going to “run all our public services in the public cloud with no more locally managed servers” (page 64) – presumably moving all services to Azure and AWS. Hopefully they will let tech-savvy journalists in to do long form pieces on what they’re doing, and provide reassurance, as this has the potential to go spectacularly wrong – with limited abilities for entities in the UK to clean up the mess, while doctors in A&E and GPs deal with the consequences of the national governance bodies screwing up yet again. This entry was posted in News on January 22, 2019 by medcon. medConfidential’s GP form continues to allow you to protect the information held by your family GP as it has always done – but the only way to protect your data collected by hospitals and in other care contexts is now via NHS Digital. But NHS Digital does not (yet) have access to your GP record, so its process requires you to take several steps – and it has also decided that those people with children must make a third. If you have children (or other dependents) and wish to express a choice about the use of their records for purposes beyond their direct care, the process is needlessly complex. NHS Digital provides no online process for families with children, even those who are registered with the NHS at the same home address as their parent, so you must use its online process for yourself alone, and then a separate postal process for any children under 13. Children aged 13 or over must express their choice about their medical records themselves online. It appears the ‘most digital’ Secretary of State the NHS has ever had would rather put the burden of understanding and action onto each patient, especially those with families, than solve the problem his officials have created. NHS Digital’s online process confirms who you are to the extent that you are able to express your choice online – yet it chooses not to ask if you have any children (which can then be confirmed in exactly the same way it confirms you are who you say you are). The move to digitise the national data opt-out left you with more work to do. This extra work for you is a deliberate choice; it didn’t have to be this way. Once you have expressed your wishes about your and your family’s data, you may also wish to write to your MP and ask them to ask the Department of Health why you are being forced to jump through those hoops. For while healthy, young, and particularly male protagonists commonly have little understanding or insight into the types of sensitive information they will one day have to divulge to their doctor, and the consequences of confidentiality not being respected, others do not have the luxury of such ignorance. This entry was posted in News on November 27, 2018 by medcon. At the start of October, the Department of Health took away your ability to opt out via your GP from having information about you, collected by the rest of the NHS, being used for purposes beyond your direct care. (The option to prevent information from your GP record leaving your GP practice remains. For now.) The new process is so ‘hip and digital’ that you also have to use the Royal Mail if you wish to make a consent choice for your children, as well as visiting your GP practice to make a choice for your GP data that the online process tells you nothing about. Is this Matt Hancock’s view of a digital NHS? We are testing a new trifold to guide families through expressing their full opt out choices –which is now a three step process: online, post box, and at the GP. This may be simpler for NHS Digital, but it’s a lot harder for you – a choice with which Matt Hancock seems to be entirely happy. NHS Digital was apparently very proud that more people opted in via the digital service than opted out in its first 2 months – though sending out 1.6 million letters could be said to have stacked the scales somewhat – but that represents at most a few hundred people a month, whereas 5,000-10,000 people a month were still opting out via their GP until the Secretary of State took that choice away from you. We have previously given a commitment that there will be a functional digital opt-out process for patients, and that if NHS Digital wasn’t going to deliver one, then medConfidential would have to (though this will likely be very analogue on their side…). 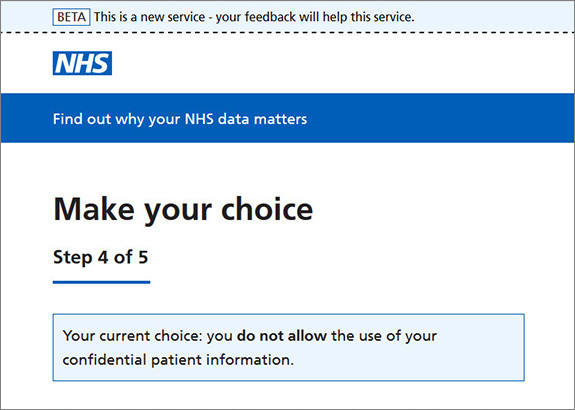 If you didn’t receive a letter from NHS Digital about the new ‘National Data Opt-out’, and since you’re reading this on our website, you should check the online process to see if your choice disappeared somewhere in the machine (and, if so, to set it to what you want). You’ll then need to set it for your children too by post – and at your GP, for your GP data, to ensure that too is set. With the National Data Guardian Bill having its second reading in the Lords this week, medConfidential has published a letter of support for the Bill. Meanwhile, the Organ Donation Bill contains a supposed safeguard that is overly complex and will not provide reassurance to those who wish to see how their organs will be used after death. We have drafted an amendment for the Lords to fix the broken Bill, if the Commons does not. As part of the next piece of NHS legislation, the National Data Opt-out should be placed on a statutory footing. The next legislation will likely be the result of NHS England’s consultation on “integrated care providers” (our response) and the “long term plan” (our response), which also referenced the need to reform invoice reconciliation. Our friends at dotEveryone published their views on digital harms and responsible technology, suggesting that data and ethics in Government should be led by someone “relatable … charismatic and imaginative”. Which would be better than the current person, whose company created the problems around commercial abuses of data in the NHS, and which is still causing problems 20 years later. The current ‘imagination’ at CDEI (the ‘Centre for Data Ethics and Innovation’) seems to be to repeat the sort of data sale scandals in Government they already caused in the NHS. The Information Commissioner also sought views on a ‘regulatory sandbox’, where companies can experiment with personal data – we had views. Data use across the rest of Government has also been keeping us occupied. Our evidence to the House of Commons Science and Technology Committee contains some new thinking on the failures of agile in public bodies. Some of that thinking was also in our response to the call for evidence ahead of the UK visit of the UN Special Rapporteur on Extreme Poverty and Human Rights, who is looking at algorithms and digital effects around Universal Credit. The data sharing powers under the Digital Economy Act 2017 are still not fully in force. This did not prevent the Ministry of Housing, Communities and Local Government (MHCLG) demanding data on every homeless person in the country, such as in Camden. The secrecy of data use in such cases must be addressed by the UK Statistics Authority / Office for National Statistics – it is doubly disturbing that MHCLG used the research process to evade the scrutiny that would have applied via other routes. Decisions by public bodies must, today, comply with the standards of the rule of law. As we move towards more automated decision-making, how will those standards be maintained? The tech companies and their apologists want the approach to be one defined by ‘ethics’ – as if no tyrant ever failed to justify their crimes. “The computer says no” (or “DeepMind says no”) is wholly insufficient for suppliers of data processing functions to government making decisions about citizens. All reputable companies will be entirely willing to explain how their “AI” systems arrive at the suggestions or decisions they make – including the (sources of) data on which they were trained. Disreputable companies will be evidenced by their failure or inability to do so. Government Departments should deliver accountability to ‘their’ data subjects (currently they don’t). But beyond accountability to individuals on how data about them is used, there are standards that must be followed by institutions – especially those which govern. The Venice Commission has produced a ‘Rule of Law checklist’, covering the context of decision-making. We’ll be taking a look at a couple of Government automated processing plans, and seeing how they conform – and how the checklist applies to digital projects, probably starting with Universal Credit and Settled Status, based on past work. We anticipate identifying holes in some of the frameworks currently used by Government, as compared with the standards required by the rule of law and judicial review. Comments are very welcome to sam@medConfidential.org. This entry was posted in Bulletin, News on October 25, 2018 by medcon. Update: NHS Digital has now published some details – which are utterly underwhelming when compared with the Secretary of State’s hyperbole. “Use the NHS number” and “upgrade from ICD-10 to ICD-11” is not the radical changes Secretary of State appeared to suggest. Although with the promise of registers, we might dust off the amendment we suggested to the Lefroy Bill (which mandated NHS numbers by law) in 2014. We will update this document when NHS Digital published the document that should have appeared at the same time. Data: “We are supportive of … Data Trusts” – does the SofS/DH have so little confidence in the NHS getting data right that he/it is supportive of stripping the NHS of that governance role? Google: The obligation on all systems to use FHIR interoperability removes the figleaf behind which DeepMind insisted on data for all patients in the Royal Free for 5 years. Google: It also proposes outlawing the monopoly line in Google’s standard contract that forces users of the Streams app to only connect to DeepMind’s servers. It is unclear whether that line will survive the lobbying it is about to receive. Amazon: Case study 7 is as true as leaving a note on the fridge, but there are other effects of giving Amazon/Alexa such information. Facebook’s new Portal offers the same functionality, and will explicitly be used to target ads at users. Below quotes can be attributed to Sam Smith, coordinator of medConfidential, which works to improve uses of data and technology in the NHS. The NHS knows what good working technology like, but to get there, you can’t just turn A&E off and on again and see if helps. Mr Hancock says “we are supportive” of stripping the NHS of its role in oversight of commercial exploitation of data. That should be a cause for widespread concern. If Matt thinks the NHS will never get data right, what does he know that the public don’t? The widely criticised National Programme for IT also started out with similar lofty vision. This is yet another political piece saying what “good looks like”, but none of the success criteria are about patients getting better care from the NHS. For that, better technology has to be delivered on a ward, and in a GP surgery, and the many other places that the NHS and social care touch. Reforming procurement and standards do matter, and will help, but it helps in the same way a good accountant helps – and that’s not by having a vision of better accounting. There’s not much detail in here. It’s not so much ‘jam tomorrow’, as ‘jam… sometime’ – there’s no timeline, and jam gets pretty rancid after not very long. He says “these are standards”, but they’re just a vision for standards – all the hard work is left to be done. This entry was posted in News on October 17, 2018 by medcon. Local Health and Care Records: exemplary, or just more of the same old? The Australian ‘care.data’ isn’t going well. Taking its lead from the English plan, the Australian ‘My Health Record’ programme claims to be about direct care and creates a new repository of patients’ data hiding behind a badly-run opt-out process, with minimal publicity that’s all about direct care; those who support it don’t actually understand it, and in the small print, the data can be copied for purposes that aren’t direct care at all. None of the lessons of care.data have been learnt there at all. Meanwhile, in the UK, NHS England has announced a set of pilots for ‘Local Health and Care Record’ schemes – 3 in May, 2 more in June – which claim to be about direct care, which may or may not create a new repository of data without an opt-out process, and about which all the publicity is only about direct care; those who support it seem not to articulate fully what it is, and in the small print, the data can be copied for purposes that aren’t direct care at all. ‘Just in time’ or ‘Eventually in case’? There is clear value in the principal public goal of Local Health and Care Records (LHCR): when a patient arrives at a new care setting, doctors should be able to see care provided only hours before – especially when it’s that which may have put the patient there. An obvious example would be a hospital doctor being able to see new medicines, prescribed that morning. This has obvious clinical value, assuming the data is up to date enough – showing data that is as current as the patient’s arrival, not yesterday. In practice, this would mean looking up records across the system as needed, rather than building yet another pile of outdated data – most of which would never be touched for care purposes, and which could be dangerously out of date if it were. The ‘glue’ required for interoperability is to simplify ‘just in time’ interoperability, rather than to copy data from everywhere ‘just in case’ it’s needed somewhere else. The driving principle must be the provision of relevant, necessary, up-to-date information. Which, as any serious technologist will tell you, means using APIs – not making and passing around endless copies of data. (‘Paperless’ shouldn’t mean promiscuous…) Building yet another set of out-of-date databases only works for the people who sell and run databases. The local areas offered as pilots apparently get to choose their own technology for their own needs. But before the ink on the LHCR announcements was dry, there were other announcements about projects that want to copy the data that the ‘pilots’ apparently haven’t yet decided upon. The money is already flowing as if they will. Clearly they all know something that NHS England isn’t telling the public. Where data is made available to ‘research’, NHS England (as data controller) will also want to use the GP data it copies for its own purposes – clinical performance management and ‘developments’ that skirt the line between research and micromanaging. The National Data Opt Out should apply to these uses – whether it will or not remains to be seen – but even so, the creation of another copy of patients’ medical records, under the control of NHS England rather than doctors, has apparently been mandated without public debate, discussion, or basic honesty. Will patients be sold the figleaf of ‘direct care’, with other uses hidden behind, in a very Australian way? However a local care record system is implemented, every patient needs to be able to have clear and specific answers to their questions: who is looking at my data? Why? And what are my choices? The advocates of dangerous data copying will continue to push for it – while the ‘spawn of care.data’ resurfaces in Australia, the toxic causes of care.data are now reappearing across this country, in the form of ‘data trusts’. Until there is a binding commitment to transparency over all data access, those who wish to copy patients’ information for secret reasons will continue to publicly claim patient ‘benefits’ for activities that are far more sordid. We have also done a deep dive into the systems, which is possibly far more than you ever wanted to know about local health and care record systems. This entry was posted in News on August 8, 2018 by Phil. A serious error affecting 150,000 NHS patients has been reported in the media in recent days, after it was uncovered last week. We understand the error affects patients who set an opt-out between March 2015 and June 2018 and whose GP practices use TPP’s SystmOne software – their opt-out codes were not sent to NHS Digital until last week. As a consequence of this error, from April 2016 until 26 June this year, those patients’ confidential, identifiable data was sold to a range of organisations, including private companies. This will obviously be of concern to a great many people. Both TPP and NHS Digital are taking remedial action; the coding error has been corrected to ensure opt-outs will be uploaded properly from now on, affected GP practices were written to on Monday 2 July, and the individual patients affected should be written to by the end of the month. b) separately, your opt-out was never applied to your GP record. If the light blue status box does not appear when you check and you do not wish your confidential, identifiable medical information to be used for any purposes beyond your own direct care, then you need to set the option on this screen to “No”. This new online process only works, however, for individuals over 13 years old – and not for families with children or adult dependants. medConfidential’s (now improved!) GP opt-out form continues to work, as it has done since late 2013. It also lets you prevent confidential, identifiable information leaving your GP record, which the National Data Opt-out does not cover. But – given this incident, and every previous breach of public trust – why can’t every patient see their data, so they can know what has happened? Patient data held by the National Health Service should only ever be used morally, safely and responsibly, and we must all work together to ensure mistakes of this nature are never repeated. We need to be able to reassure patients that their wishes concerning their data are being respected. This incident highlights the critical need for transparency – to ensure that it is clear where data is going and how choices are honoured. It also demonstrates that a trustworthy system must not just say the right things but also do the right things in practice as well: if opt-outs are claimed to be honoured, they absolutely must be. If these standards are not upheld, there has be clear accountability in the system, with sanctions if necessary to demonstrate that these issues are taken seriously, or public confidence will again suffer. Astonishing and appalling failure to uphold patient objections: but what sanctions to ensure providers uphold the standards we expect of them? New opt-out, which is patient-registered rather than GP-registered, *should* be less liable to such errors though. We are all agreed on the importance of the public not being surprised by how NHS uses data, so this is just remarkable. …if your family has children under the age of 13, or if you look after a dependent older relative, then things are even more complicated. Rather than giving a simple instruction to your doctor, those who would prefer their children’s data wasn’t sold to third parties for unknown purposes, will be required to send to NHS Digital, by post, four pieces of ID documentation along with a seven-page form. So much for Jeremy Hunt’s much-vaunted commitment to a ‘paperless’ NHS. Given the significant effect this will have on people far wider than the 150,000 currently affected, you might want to ask (a) Understanding Patient Data, or (b) your MP, what they are doing to ensure the broken process for families making a decision together is fixed. This entry was posted in News on July 4, 2018 by Phil. One of the existing patient opt-outs has been renamed as the new National Data Opt-out, but a whole swathe of issues that have festered, unaddressed, for years still remain. We consider these issues below, framed by questions of – and glaring omissions to – the ‘Your NHS Data Matters’ communications campaign, launched on GDPR Day. The word “us” appears to be doing a lot of work here; would patients expect “us” to include, for example, commercial information intermediaries such as Harvey Walsh Ltd? All well and good, if true – but what about all other ongoing (and future) uses of patient information besides “research and planning”? Why does the new National Data Opt-out not use the far clearer, more accurate, and comprehensive Caldicott 3 definition of “purposes beyond direct care”? If the new National Data Opt-out does cover the use of patients’ information for all purposes beyond their direct or ‘individual’ care, then why not say so? If it does not, then how does the ‘new’ opt-out meet the requirements of Caldicott 3, the recommendations of which the Government accepted in full? medConfidential recommends: Be accurate! All public communications must in the first instance use the proper Caldicott 3 formulation, “purposes beyond direct care”. These purposes may be further explained in terms of “research” and “planning”, but public explanations must be clear that uses are not limited to only these two purposes. To do otherwise would both mislead patients and undermine the effectiveness of the opt-out, and could lead to further collapses in public trust when people become aware of uses that do not clearly fall into either category. This is utterly muddle-headed, and goes against what many (if not most) people reasonably understand is meant by the word “confidential”. While the example given is relatively benign it is precisely this loophole that, not coincidentally, led to the scandal of the Home Office MoU. This is not even close to true! We consider other uses, such as commissioning and commercial re-use in more detail below, but this statement is demonstrably untrue: take, for example, the HRA Confidentiality Advisory Group’s Non-Research Register, which contains ongoing uses such as invoice reconciliation, risk stratification, commissioning and projects that explicitly mix direct care and secondary uses. medConfidential recommends: Don’t mislead patients! Be more clear and explicit about the range of uses to which patients’ information are put. While public communications must be as clear and as understandable as possible, they must also be accurate – and true. The split between “your individual care” and “research and planning” (a description that we note above is itself too narrow and misleading) is far too simplistic, especially when patients are being asked to make an informed consent choice. No definition of “anonymised” is provided. Using this word without explaining what it means is misleading; the natural (i.e. many patients’) assumption is that “anonymised data” is anonymous, which is not the case. GDPR and guidance from the ICO now makes it clear that what NHS Digital has been disseminating “most of the time” is identifiable data. That only some identifiers are being removed, or pseudonyms substituted, must be explained – and linking to a third party, non-NHS information source to do this will hardly be reassuring to many patients. Hiding behind narrow legalistic reasoning and jargon never has and (especially post-GDPR) never will solve major long-standing issues. medConfidential recommends: Follow the law! Stop implying that ‘anonymised’ is the same as anonymous, and respect people’s opt-outs for all identifiable data – don’t keep trying to find loopholes and excuses. We are not aware that this is, or ever has been, in dispute. Clearly there are benefits to lawful, ethical, consensual, safe, and transparent data sharing. Problems come when, as with the care.data programme and previous attempts at public communication, the NHS tries exclusively ‘selling the benefits’ without even mentioning any of the risks. Addressing these directly helps people make sense of the mitigations used – and such measures are no longer just arbitrary claims or assertions – and enables a more informed choice on that basis. As we note above, the narrow definition “research and planning” does not even come close to defining the full range of uses, for purposes beyond their direct care, to which patients’ information is put. These omissions aside, and while ‘Your NHS Data Matters’ lists some types of organisations that may do “research” and acknowledges the use of patients’ information “to support the delivery of health and social care” (conflating both direct care and “planning”) it makes no mention of the types of organisations that may be involved in “planning”, and all of the activities that term is supposed to encompass. Given that it is precisely those people and organisations that may have access to their information that matters to most patients who have concerns, this is another serious omission. Without it, how are patients supposed to make an informed choice? medConfidential recommends: Be honest and upfront about who will have access to patients’ information; patients should not be assumed (or required) to understand the inner workings of the health and care system in order to make choices. It may be argued that NHS Digital’s Data Release Register performs this function. However, linking to a massive Excel spreadsheet, containing literally thousands of individual entries, puts too much of a burden on any normal individual and – given the disparity between this and the level of detail provided elsewhere – begins to look like obfuscation. We understand NHS Digital is working on a more clearly-formatted HTML publication of its Data Release Register but, in its absence, medConfidential has provided a more readable version that – unlike the current Register – contains links to NHS Digital’s audit reports, for those organisations that have been audited. medConfidential recommends: Continue improving the transparency of data use. For example, besides audits (and actions taken) future Registers should link to the relevant DARS and/or IGARD documentation; showing there is a process, and that the process is being applied competently and consistently is an important way to build and maintain trust. It is unfortunate that the “NIC numbers” given in current Registers are entirely self-referential to anyone performing, e.g. a Google search; concealing or obscuring relevant parts of the process raises and persists doubts. Why are “pharmaceutical companies” the only ones on this list whose use of patients’ information is qualified? Is the claim that pharmaceutical companies only receive patients’ data for the specific purpose of researching new treatments? This is patently untrue, and leads onto the further spurious claim that patients’ information will not be sold for “marketing or insurance” purposes. While this claim may be narrowly true, at least for “commercial insurance purposes”, it omits to mention that at least some information intermediaries (i.e. commercial re-users, now sometimes referred to as “health and care analysis companies”) which regularly receive data from NHS Digital still service pharmaceutical marketers. NHS Digital cannot state definitively who does or does not reuse patients’ medical records, as it specifically chooses not to know. medConfidential recommends: Stop misleading patients as to the ultimate uses of their data, and stop sending out copies of everyone’s hospital histories to companies which (also) profit from servicing non-NHS commercial interests. ‘Your NHS Data Matters’ makes quite a few assertions about what will and will not be done with your data – though, and especially given the tendency to use jargon and narrow legalistic terms, it would be good to provide evidence and to clearly define key phrases. For example, we presume “confidential patient information” and “data” are two different things. In addition, as noted above, linking to a third party, non-NHS information source to achieve some of this – however good the explanation – will hardly be reassuring to patients with concerns. Another glaring omission, given the significant number organisations that do not provide health and care services, but that do use patients’ information for purposes beyond their direct care, is the list of the steps those organisations are supposed (required?) to take to protect patients’ data. The list of steps for such organisations clearly cannot be the same as those for NHS bodies, in that some of these organisations do not “make it clear why and how data is being used”, and others hide behind the information intermediaries’ commercial reuse contracts to, e.g. measure the efficacy of pharma sales, and to market their products to NHS doctors and commissioners. medConfidential recommends: Make it a requirement to report to NHS Digital (and thence to patients) how data is used by everyone; stop relying on commercial reuse contracts and the “promotion of health” loophole in the Care Act 2014 to persist what are self-evidently marketing uses. This feels more like an inquisition than a ‘choice’. Given how fundamentally broken NHS Digital’s new ‘Beta’ opt-out process is, medConfidential recommends patients who have concerns use the opt-out form we’ve provided since late 2013. We updated our form in line with recent changes and it still works for you, your dependant children and others for whom you are responsible – it also protects your GP data from uses beyond your direct care, not just your data supplied to NHS Digital. With all that is and will be changing, medConfidential also strongly recommends you get yourself a Patient Online account, if you don’t already have one. We provide more information about this on the ‘For patients’ section of our website. Though it will still be some time until you can see how all of your data has been used, by which organisations and for what purposes, a Patient Online login to your GP’s online system should already allow you to see how your GP data is being used. One critical question is whether patients’ opt-outs will now be honoured in the dissemination of ‘Hospital Episode Statistics’. HES comprises two-thirds of data releases from NHS Digital, most of those to commercial companies – including all of the commercial reusers. Until now, over 1.4 million patients’ wishes in this regard have been ignored. Apparently officials believe IGARD, a body of NHS Digital’s own creation, can decide to override patients’ dissent when, in fact, the only body with a statutory basis to approve such exceptions is the Confidentiality Advisory Group (CAG) at the HRA. Both GDPR and the UK’s new Data Protection Act clarify and extend the definition of identifiable data such that – the day before GDPR came into effect – staff at NHS Digital were ordered not to disseminate any “anonymised” patient data. Data releases were resumed the following day, but NHS Digital is still in discussions with the Information Commissioner’s Office as to what patient information can now be considered “anonymous”. Under GDPR, this is unlikely to include HES in its current form: individual-level, lifelong hospital medical histories, where every event is dated and linked by a pseudonym. Given a mother with two children is over 99% likely to be identifiable from her children’s birth dates alone, and given the enhanced GDPR ‘right of access’ to any data received by any customer of NHS Digital to which opt-outs have not been applied, it would seem not only unlawful but highly irresponsible for NHS Digital to keep selling what GDPR now defines as the identifiable patient data of those who have opted out. This entry was posted in News on June 14, 2018 by Phil.